Elizabethan Theatre and the Globe Theatre Interior. The Pit, or yard, was the area located around the stage. There was no seating - the cheapest part of the Globe Theater and the audience had to stand. The stage structure projected halfway into the ' yard ' where the commoners (groundlings) paid 1 penny to stand to watch the play. They would have crowded around the 3 sides of the stage structure. They were referred to as Groundlings and were Elizabethan Commoners who paid 1 penny admission to stand to watch the play. During the height of the summer the groundlings were also referred to as ' stinkards ' for obvious reasons. 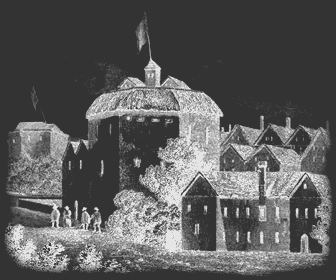 Around the Globe theater were three tiers of roofed galleries. The galleries had rows of wooden seats, were accessed from a back coridor and had a roof offering shelter from inclement weather. The stage wall was called the ' Frons Scenae ' taken from Latin. It was situated behind the pillars. The ' Frons Scenae ' was taken from the name given by Imperial Rome to the stage walls of their amphitheatres. There was a doorway to the left and right and a curtained central doorway from which the actors made their entrances. Above the door area was the highly decorative screen. The Stage Gallery above the Stage Wall was called the ' Lord's rooms ' used by the rich members of the audience, the Upper Classes and the Nobility. Immediately above the stage wall was the stage gallery which was used by actors (Juliet's balcony). The ' Lord's rooms ' were considered the best seats in the ' house ' despite the poor view of the back of the actors. The cost was 5 pence & cushioned seats were provided for these elite members of the audience. There were additional balconies on the left and right of the ' lord's rooms ' which were called the ' Gentlemen's rooms '. These seats were for rich patrons of the Globe theater and the cost was 4 pence for which cushioned seats were provided. The stage wall structure contained at least two doors which lead to a leading to small structure, back stage, called the ' Tiring House '. The stage wall was covered by a curtain. The actors used this area to change their attire - thus it was called the 'Tiring House'. The ' Hut ' Above the ' Tiring House ' was a small house-like structure called the 'hut' complete with roof. The Hut was used as a covered storage space for the acting troupe. Details, facts and information about the Globe Theatre Interior in the Elizabethan Theatre can be accessed via the Elizabethan Era Sitemap.